Is This One Of The Libertines' Most Spiritual Interviews Ever? Pete Doherty and Carl Barat spoke to Gabby Sanderson at Ibiza Rocks and things got a bit weird. 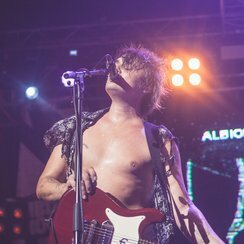 The Libertines played a rapturous set last night (22 July) at the 10th Anniversary of Ibiza Rocks. The Libs are big fans of playing the White Isle (they've both appeared there over the years in different incarnations) and have always adored the crowds. Gabby from Propaganda was lucky enough to catch up with the newly reunited band. And they gave her, well, a classic Libertines interview. It was shambolic and impossible to keep track of. Dare we say, it was one of their most bizarre yet? While things began pretty typically, Pete soon digressed into long descriptions of the majesty of Ibiza, and Carl couldn't have agreed more. "Ibiza's got something magical and mystic about it, people have been here since the sixties seeking escape from poison" Pete said. Carl added "even Franco couldn't stop the energy of what this island does." You can listen to the full interview with Gabby below. The Libertines recently announced plans to release their first album in eleven years. The record will be entitled Anthems For Doomed Youth and will be released on 4 September.